In Foreign Policy Breakthroughs: Cases in Successful Diplomacy, editors Robert Hutchings and Jeremi Suri focus on a number of diplomatic successes since 1945, arguing that diplomacy not only functions as an adjunct to force, but also as a means of building international networks of cooperation dependent upon necessary compromise and sustainable agreements. This book offers important insights into the intricate methods upon which diplomacy depends through historical case studies that remain highly relevant to contemporary conflicts, writes Robert Ledger. 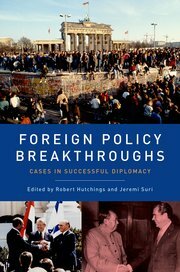 Foreign Policy Breakthroughs: Cases in Successful Diplomacy. Robert Hutchings and Jeremi Suri (eds). Oxford University Press. 2015. That a new book on foreign policy successes is a work of history is an unfortunate – but expected – fact of contemporary international relations. For Robert Hutchings and Jeremi Suri, editors of the new volume Foreign Policy Breakthroughs: Cases in Successful Diplomacy, this is partly because ‘diplomatic capability appears most lacking in contemporary foreign policy leadership’ (1). This book examines a number of diplomatic ‘successes’ in the post-1945 era, understanding a success in terms of how diplomacy has increased the options for policymakers to address difficult issues. The result, far from solely being historical in nature, offers us a selection of key insights and principles that could be applied to some of today’s intractable foreign policy problems. The authors of Foreign Policy Breakthroughs have impressive credentials, including academics, policymakers and diplomats. One of the editors, Suri, has authored a number of books on foreign policy and diplomacy, including one on the profession’s most notable practitioners in Henry Kissinger and the American Century (2009). This new collection focuses on the process of diplomacy and how seemingly unworkable problems have been approached since the Second World War. The reader is left to ponder how these techniques could be applied to modern-day impasses, such as the conflict in Syria; how diplomacy of the past compares with the drawn-out Iran nuclear discussions; or even something more novel like climate change. This is what makes the book so relevant. It is hard not to agree with the authors that – particularly as armed conflict shows no sign of abating – the diplomatic element often attracts less emphasis in the modern analysis of foreign affairs. Although each chapter indicates a successful process, the book is broadly split into three categories of case studies: outcomes deemed as successful, mixed or unsuccessful. Those in the former category include President George H.W. Bush’s diplomacy at the end of the Cold War; mixed results include the 1978 Camp David Accords; and those deemed unsuccessful include the 1955 Bandung Conference of newly independent states. Also in the latter category are attempts to set up a dialogue, or at least put a process in place, between aid agencies and Taliban-era Afghanistan. Despite the chapter being an interesting take on 1990s Afghanistan, it is quite a stretch to accept that any interaction between the outside world and the Taliban was fruitful during this period. How a successful process or outcome is gauged is, of course, contentious. The reader is left feeling that little of the actual Camp David process was successful, whereas the chapter examining Bush’s diplomacy is very positive (indeed, the author worked as a US diplomat during those transformational years). The conclusion of the book outlines successful diplomacy as not creating winners or losers, but as finding sustainable ways of improving the positions of as many participants as possible (266). With that in mind, the recent behaviour of Russia calls into question how successful President Bush and his western allies were in creating a durable peace in Europe. What Hutchings does very well in Chapter Seven, however, is outline empathy as a key characteristic in successful diplomacy and one of Bush’s, and Secretary of State James Baker’s, greatest assets. The consideration of what Ronald Reagan might have done in his place, or a different Soviet leader instead of Mikhail Gorbachev, convincingly outlines how nuanced diplomacy was employed before and after the fall of the Berlin Wall. The chapter also discusses another of the book’s themes: the ‘two-level games’ that diplomats employ to satisfy or cajole domestic and international opinion. Bush and Baker offered the Soviets something at each stage of the talks regarding Germany’s unification and membership of the North Atlantic Treaty Organisation (NATO). The idea of two-level games is woven into one of the book’s more distinctive chapters, concerning Mexico’s approach to its North American Free Trade Agreement (NAFTA) negotiations in the early 1990s which, at least for this reader, contained less widely known details. Kissinger looms large in discussions of diplomacy. Some of the techniques used in the US recognition of China under Richard Nixon – ‘triangular diplomacy’ – are discussed in Chapter Five, such as working on the biggest issues first; using other actors as conduits or ‘backchannels’ (in this instance Pakistan); the use of signals; flexibility; and the importance of finding mutual interests. Kissinger provides the book with its core tenet: successful diplomacy increases policy options (255-56). Of course, many critics have vilified Kissinger’s methods, often shrouded in secrecy, of ‘Realpolitik’, but few politicians have developed strategy on such a grand scale. Leadership is another theme that runs throughout this book. A favourite point of debate for historians and political scientists is the relative importance of structure and agency. Although not disregarding the former, this book clearly puts emphasis on the importance of statesmanship and individual decision-making. The authors, however, are less interested in leaders of the ‘Great Man’ variety, but rather in restrained, empathetic and far-sighted ones who understand how to use the levers of government and carry public opinion. Finally, and more technically, it explains ‘one of the fundamentals of negotiating strategy is to negotiate interests rather than positions’, which, as Hutchings points out, requires a ‘high level of understanding of the other side’s needs, objectives and likely tactics’ (165). Foreign Policy Breakthroughs will be of interest to students and academics concerned with foreign policy, international relations, diplomacy and contemporary history. It posits diplomacy not only as a tool of power or adjunct to force, but also as a means of building an international system of mutual coexistence and cooperation. This collection provides the reader with a wider appreciation of what skilful diplomacy aspires to achieve: not zero sum winners and losers, but necessary compromise in serving the interests of individual actors in sustainable agreements. With foreign policy disasters piling up over the last few years, the ideas and principles found in the historical case studies of Foreign Policy Breakthroughs deserve a second look. Robert Ledger has a PhD from Queen Mary University London in political science, his thesis examining the influence of liberal economic ideas on the Thatcher government, and an MA in International Relations from Brunel University. He has worked in Brussels and Berlin for the European Stability Initiative – a think tank – on EU enlargement and human rights issues. He has published widely on European and British politics, edited the Journal of International Relations Research and is also a regular contributor to Global Risk Insights, a political risk group.